Why not take advantage of special savings while finding the pain relief you need? The Rhythm Touch Special Bundle is the perfect way to do it! Our special bundle offers the electrical muscle stimulator along with extra products you will love including a genuine leather case. The leather case allows you to hold the Rhythm Touch on your belt, permitting you to take it with you wherever you need to go. It also protects the Rhythm Touch in your purse and acts as a handy storage while at home. This Class II medical device uses Transcutaneous Electrical Nerve Stimulation (TENS) and Electrical Muscle Stimulation (EMS) to simultaneously stimulate and condition your muscles while blocking pain signals to your brain. This combination of the two types of stimulation provides release from aching muscles and painful joints. Another benefit of EMS is that it releases endorphins in your body which is your body’s own natural pain relieving mechanism! Manufactures Carrying Case for above. 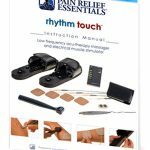 An extra set of four premium Pain Relief Essentials brand of Rhythm Touch Replacement Pads. Click Here to check out the download version of the manual prior to ordering (email required). It does not include the color charts as they make the download too large. Save 10% today on the Rhythm Touch Special Bundle. ⇒ Join our newsletter for code. We are proud to offer a 30 day money-back guarantee; we firmly believe you will truly experience a new lease on life when the Rhythm Touch releases you from your painful muscle aches and strains. Products are normally sent either the same or the next business day from the day your order is placed. During holiday periods there may be delays. If so, next day delivery via United Parcel Service will arrive two business days after your order is placed. What are people saying about the Rhythm Touch?